There was once a sage called as Shilada. Shilada did not have any children. of his own, but he adored children. He wanted to adopt a child, but he did not want to adopt just any child. He wanted a special child blessed by Lord Siva. So he worshipped Lord Siva for many years. 'A child. I wish to have a child, Lord Siva.' Shilada said bowing before Lord Siva. Siva smiled. 'You shall have it soon' He said and vanished. Shilada returned home a happy man, knowing that the Lord would bless him with a very good child. The next day he went to the farm to begin his ploughing, when he found a beautiful baby in the field before his plough. The baby's skin glowed with a beautiful white light. Shilada was overjoyed as he took the boy home. He named the boy Nandi. Right from his childhood, Nandi was devoted to Lord Siva. Shilada brought up the child with love and care. Shilada taught the child the Vedas and gave the child a good education. Nandi was a brilliant boy and learnt everything very fast. Shilada felt very proud of the child. Nandi looked after the two sages well and after enjoying the stay, the sages said that it was time they left. Before they were about to leave, Shilada and Nandi both prostrated before the two sages. Mitra looked at Shilada with pity, 'I cannot wish your son a long life....' Mitra said softly. Shilada looked in absolute panic. 'What is going to happen to my son?' He whispered. 'Your son, does not...' Varuna cleared his throat, '...does not have long to live, Shilada. I am sorry...' He said lamely, looking at the horrified expression on Shilada'a face. Shilada stood there transfixed for a long time. After a long time, he slowly walked back home with stooping shoulders and a broken heart. Nandi immediately guessed something was wrong, 'What is it father? What happened? What...' Nandi asked, vigorously shaking his father. Slowly and painfully, Shilada narrated his conversation with the two sages. He expected Nandi to be scared or even that Nandi would even start crying. However Shilada was surprised when he heard Nandi's laugh. 'You were scared of what the sages said!' He said still laughing. Shilada wondered what could be so funny and looked at his son without any expression. Shilada still looked dumbly at his son, not understanding. 'Father, it is my fate to die, then Lord Siva can reverse my fate! He is the most powerful God and can do anything. Do you think he would let anything happen to us, when we worship him?' Nandi looked at his father challengingly. 'I don't think so., father..' Nandi said softly. Shilada looked at his son as if looking at him for the first time. Slowly Shilada nodded his head and smiled. Nandi then went near the River Bhuvana. He entered the river and began his penance. His devotion was so great and his concentration was so high, that Lord Siva appeared almost instantaneously. 'Nandi, open you eyes!' said the three eyed God tenderly, looking at Nandi. Siva looked at Nandi with lots of love, 'Nandi, your penance was so powerful that it dragged me here immediately! Ask me anything I will grant it to you!' Siva said. 'Lord I wish to be with you always.' The words were out of Nandi's mouth before he could stop them. Since then Nandi became Siva's vehicle, doorman, his companion and the head of all of Siva's attendants – the Ganas. 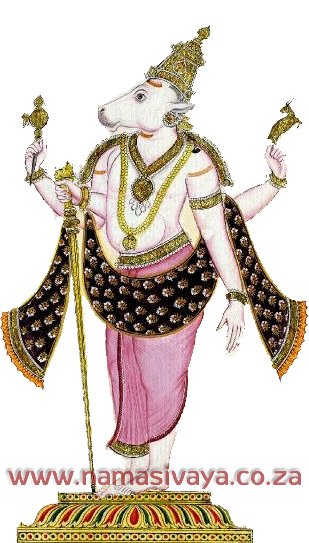 Thus by sheer devotion Nandi was not only able to overcome his fate, he also rewrote it! A few days later the Devas and the Asuras together churned the ocean for nectar. However the first thing that emerged from the churning was the poison Halahal. The poison was so strong that it threatened to destroy the whole world. To protect the world, Lord Siva collected the poison in his hand and swallowed it. Goddess Parvati who was near Lord Siva clutched Siva's throat to make sure that the poison was stored in the throat and would not affect Lord Siva. However some Halahal slipped out of Siva's hands and fell on the ground. Nandi gathered the fallen Halahal and seeing his master drink it, he also drank it! The three of them smiled and then returned to Kailash.